Lock in a great price for Crown Lanta Resort & Spa – rated 8.8 by recent guests! Great location, you have a private beach and still walking distance to the public beach. We also had a great view of the ocean from our room. The staff was amazing, they helped us book a 4 island tour which I would also highly recommend! The staff were exceptional very helpful and friendly . The Reggae bar where you can watch the sun setting in your own private booth was also fantastic . We were luck enough to get to enjoy a fire show on the beach below just after sunset. Friendly staff, quiet and pretty grounds. Reggae bar was awesome. Always taxi available. Breakfast was good. Loved the fact that we had access to the pool from our room. Great views and staff was very helpful. The service was the best part. Everyone was extremely polite and helpful. Always had a smile on their face. The view feel the room was really great. There are some rooms that have pool access from the balcony which was amazing. We were attracted by positive comments about Crown Lanta online and booked for 3 nights. The hotel did not disappoint us: very good sea view, nice swimming pools, respect for privacy and amiable hotel staff who always smiled and extended warm helps. We would like to thank Boy and Jane for their hospitality as hotel reps. 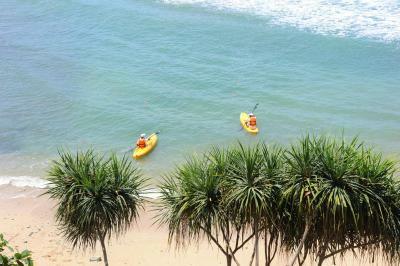 I would like to recommend Crown Lanta if you crave for a peaceful and comfortable vacation in Lanta, Krabi. We had an incredible pool villa with a view to Phi Phi island and glorious sunsets. I highly recommend the Rock Bar around the corner at the end of the peninsula as well. Since we arrived the staff was amazing, trying to make our time there excellent, which we really appreciate since the minute we landed in Krabi a tropical storm hit the island and we were quite limited. I would recomend this hotel to everyone, reggae bar is a wonder! Crown Lanta Resort & Spa This rating is a reflection of how the property compares to the industry standard when it comes to price, facilities and services available. It's based on a self-evaluation by the property. Use this rating to help choose your stay! One of our top picks in Ko Lanta.Crown Lanta Resort & Spa offers a private beach, luxury accommodations, and extensive services. It is ideally located on an elevated peninsula in Ko Lanta, offering views of Andaman Sea. Free WiFi access is available. Some facilities at Crown Lanta include restaurants and a bar, free mountain bikes, kayaks, snorkeling gear, and a gym. Guests can make use of transfers from the Airport in Krabi and shuttle transfers to Saladan center (10 minute drive away) where shops, restaurants, convenience stores, and banks are located. When would you like to stay at Crown Lanta Resort & Spa? This room features a bedroom and an private bathroom equipped with a rain head shower. Guests can relax in the daybed provided at the private balcony, overlooking views of the swimming pool and the garden. With a direct pool access, this room features a bedroom and a bathroom equipped with a rain head shower. Boasting a comfortable living area, this ocean private pool villa offers a bedroom and an private bathroom equipped with a bathtub and a rain head shower. The private swimming pool overlooks stunning views of the Andaman Sea and Phi Phi Island. With an outdoor private swimming pool and deck area, this Grand Villa residence features two bedroom, two bathrooms, two living spaces and a kitchenette. It is located atop the peak of the island, overlooking stunning views of the Andaman Sea. House Rules Crown Lanta Resort & Spa takes special requests – add in the next step! Crown Lanta Resort &amp; Spa accepts these cards and reserves the right to temporarily hold an amount prior to arrival. Crown Lanta Resort & Spa accepts these cards and reserves the right to temporarily hold an amount prior to arrival. Pool access directly from room was really nice. Reggae bar was amazing place. Friendly staff was always willing to help. Pool access rooms definatly worth doing. Staff are very friendly and will go above and beyond to help you. The location took longer than expected due to a barge crossing. No information about it. The other restaurants had very average food. We were expecting local cuisine, instead we got American. The breakfast was amazing, including a stunning view. Gym is pretty basic - although you will get plenty of steps walking up and down the hills of the resort! Pool villa was amazing. Breakfast was good. Quick trip into Saladan if you need to get anything, but why leave your pool villa? Chicken satay sticks on room service were delicious! Staff are very friendly, can’t help enough. Service throughout all our stay was impeccable! Lovely resort for a quiet relaxing get away. Not best location. Could not walk anywhere. Needed tuk tuk to go anywhere. These were always available just outside the gate. Breakfast just moderate. Rooms are old fashioned. The patio and pool was crawling with ants, which also found their way into the bathroom. There was a lot of leaves in the pool which we had to fish out ourselves with an umbrella. There were also several mosquitoes inside the room, as the patio doors were left open on arrival. Overall, the cleanliness left something to be desired. We stayed in a room with a private pool, which was accompanied with a big price tag. The decor was great and the bed was comfortable. The pool was sizeable and had a stunning view over the sea. Nothing to fault whatsoever, this place is paradise! Best hotel we've ever stayed in, anywhere. The staff, service, food, cleanliness, location, everything is exceptional. We stayed an extra night and plan to return!